Two airports service Rome, Ciampino Aiport (CIA) and Fiumicino Airport (FCO), and both of them are located outside of the city. So, to get into city center where all of the tourist attractions are, there are several options depending on which airport you flew into or are departing from. For us, since we flew into FCO and departed from CIA, we had the opportunity to learn the transportation options for both airports. Tip: If you have Priority Pass Lounge Access we recommend flying out of FCO Airport if possible. Unfortunately, as of the time of our visit, CIA Airport didn't have any lounges. If you don't yet have Priority Pass we can't urge you enough to get a membership! With over 1,000 lounges around the world, it's the perfect accompaniment for any frequent traveler or digital nomad. From FCO we chose the Terravision bus (€6 each for a non-stop journey) along with every other budget minded tourist and wise local. And, while sometimes we choose the fastest or the easiest travel option, for our departure flight from CIA we chose the €1.50 (cheapest) option that was sure to offer an adventure! Whichever airport you’re getting to or from, if you’re taking public transportation you’ll be traveling via Termini Station, Rome’s central public transportation hub. It’s absolutely huge and offers bus transportation, stops for both Metro Line A and Line B, and has over 20 platforms for local and regional trains. Besides the transportation options, it could easily be mistaken for a mall, with its clothing stores, luxury boutiques, cafes, fast food, full service restaurants, a book store and two supermarkets. If you’re looking for a quite escape at a coffee shop, this is probably not the place you want to look, as you may constantly be approached to purchase tourist packages, train tickets, souvenirs, and selfie sticks. Termini Station in Rome, Italy is a main transportation hub. It can be a bit overwhelming when you first walk in, since there are people passing in all directions and others approaching to sell you souvenirs and tours around the city. The metro station is located on the west side of Termini Station in Piazza dei Cinquecento (a public square and prime location to hire a taxi). You can enter Termini station from the square and purchase train tickets, either from the ticket desk (opposite the entrance), or from one of the automatic ticket machines. Ticket machines are located throughout the station, but we’d recommend turning to the left when entering from Piazza dei Cinquecento, since you’ll likely find several rows of machines and shorter lines, if any at all. To the left of the Piazza dei Cinquecento entrance you can find customer service for the trains if you run into any issues. Simply find the attendant’s desk in the center of the row of windows and tell them what you need help with, they in turn will give you a number for the appropriate window. You can also enter Termini station from the sides, either on Via Marsala or Via Giovanni Giolitti. There are several entrances, but you’ll likely best be served by using the entrances at the north end of the building. Here you’ll enter the mall area, but also have access to ticket machines and ticket desks. Throughout the main area look up and you’re bound to see a large digital sign with the schedule of upcoming trains and their corresponding platforms. Termini Station in Rome, Italy. To find the train platforms, if you’re in the north central areas of the station, you’ll walk in a southern direction. The majority of the platforms are just after the two main corridors of the station (where you purchase tickets and the mall). Once you enter the area you’ll see the manned platform entrances and the trains. Additionally, small green and white machines are located on the platforms and near ticket machines to validate your ticket before boarding a train. 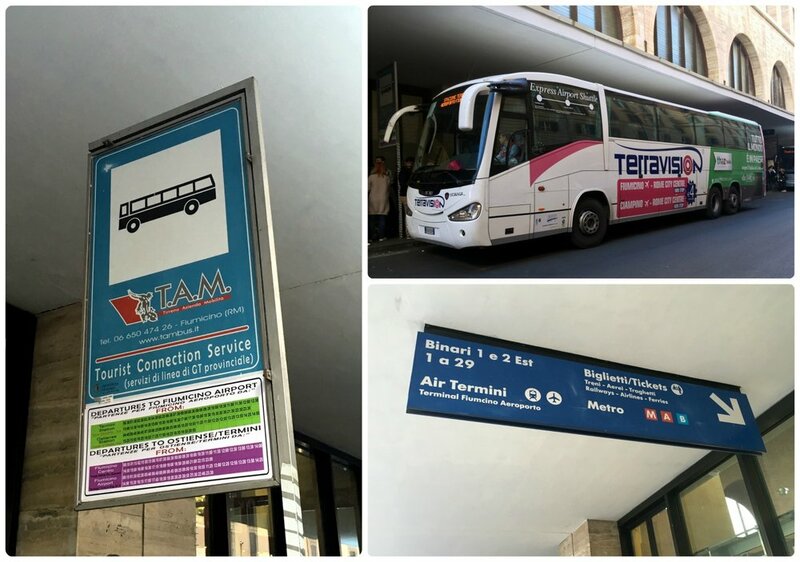 To find bus services to the airport, you’ll need to stay on the outside of Termini Station on either on Via Marsala or Via Giovanni Giolitti (about midway down either street). You can purchase bus tickets to the airport on board the bus or online (Terravision, SitBus, ATRAL). To find the public city buses, head to the front of Termini Station and Piazza dei Cinquecento. Here you’ll find a large station for city buses as well as a small green kiosk offering information on public transportation. At Termini Station in Rome, Italy the bus to and from the airport drops off on either Via Marsala or Via Giovanni Giolitti. Look for signs to find the correct pick-up location. Since all roads generally lead to Termini Station, if your hotel or destination isn’t within walking distance, you can easily take the metro, a bus, or a taxi to your destination. Tip: Restrooms in Termini Station aren’t free unless you’re a customer of an establishment that offers a restroom. You can expect to pay €1 for restroom access at the station. Before we get to the alternative super inexpensive option and our adventure, we’ll briefly go over the standard transportation options for each Rome airport (valid at the time of our visit). Near the baggage claim is the Leonardo da Vinci Express Train. It’s a simple option, takes 30 minutes to get to Termini Station in Rome, and costs €14.00 (children under 4 years of age are free, and one child between 4 and 12 years of age is free per paid adult). Trains leave every 30 minutes, or every 15 during busier periods, and service starts just after 6 am and ends with the last train departing FCO airport at 10:23 pm. You can purchase tickets for the Express Train at the ticket windows or automatic ticket machines within the airport. Be sure to validate your ticket before boarding and to hold on to it for the duration of the journey. When you’re returning to the airport from Rome, the Leonardo da Vinci Express Train leaves from platforms 23 and 24 in Termini Station. Trastevere – Transfer to the FL5 train here if you’re heading to the cruise port in Civitavecchia. You can also transfer to the FL3 train at Trastevere. Ostiense – Change here to Metro Line B or regional trains FL3 and FL5. Tuscolana – Change here to Metro Line A or regional train FL5. Tiburtina – Change here to Metro Line B or regional train FL2. If you’re planning on transferring to a Metro line, keep in mind that you’ll need to purchase a €1.50 metro ticket separately. Trains run every 15 minutes, except on holidays and Sundays when they depart every 30 minutes. You can purchase tickets at the ticket windows or automatic ticket machines at the airport. Be sure to validate your ticket before boarding and hold on to it for the duration of the journey. For more details on the train and timetables, we recommend using the journey planner on the Trenitalia website. There are several companies offering bus services from FCO to Rome, via Termini Station. Tickets are between €5 and €6 per person and can be purchased at the ticket windows outside of terminal 3 or online ahead of time. When exiting baggage claim and customs, make a left turn and follow the overhead signs for the buses. You’ll have a few carriers to choose from, but we chose Terravision because they offer a non-stop route to Termini Station which takes about 55 minutes. To find the bus terminal at Rome's Leonardo da Vinci–Fiumicino Airport, simply follow the signs. Once in the bus terminal area, you can purchase tickets at the counter. There are several companies in Rome offering private vehicles to and from FCO Airport. Prices start at about €65 (depending on the vehicle type), and while far from the frugal option, might make sense if you’re traveling in a group or want the fastest, simplest, and most comfortable ride into Rome. Tip: Be sure to check reviews online and book a reputable company. There are plenty of options for taxis, but be aware that the city has set a flat rate fare from FCO into Rome. Specifically the flat rate fare zone is considered anywhere within historic city center Rome, known as “within the Aurelian Walls” (this PDF map of Rome shows the zone in yellow). Tip: The taxi driver should not start the meter since it’s a flat rate. *As of the time of our visit. Uber is available in Rome, however it's been banned and reinstated a few times, so before counting on Uber, be sure to check ahead of time to confirm it’s still available. Plus, at the time we visited, only UberBlack (professional drivers and a more expensive service) was available. Get a discount on your first ride when you use our Uber link. The train runs close to CIA Airport, but unfortunately not to it. If you want to take the train to Rome, you’ll first need to take a bus (ATRAL or COTRAL) to Ciampino Train Station for €1.20. From there the train will get you to Termini Station in Rome for €1.50. If you time your trip correctly, this approach can be the fastest and least expensive option. If you don’t fancy paying two fares and switching from the bus to the train, see how we got to CIA on just the train, and for only the €1.50 fare! The bus is direct to Termini Station and costs €5.00 a person. Both Terravision and SIT bus have airport transfers. We rode on a Terravision bus while in Rome and enjoyed the ride. If your destination is along Rome’s metro Line A, then you can take a bus to the metro station (€1.20 per person and an additional €1.20 per piece of luggage) and then the metro train to your final stop (€1.50). The metro system in Rome, Italy. There are several companies in Rome offering private vehicles to and from the CIA Airport. The price should run around €50 (depending on the vehicle type), and while far from the frugal option, might make sense if you’re traveling in a group or want the fastest, simplest, and most comfortable ride into Rome. There are plenty of options for taxis, but be aware that the city set a flat rate fare from CIA Airport to Rome. Specifically the flat rate fare zone is considered anywhere within historic city center Rome, known as “within the Aurelian Walls” (this PDF map of Rome shows the zone in yellow). We needed to get from Rome city center to CIA Airport to catch our flight to Madrid, Spain. We weighed all the options and considered taking a bus at a mere €5, but then we read that, while it wasn’t advisable for everyone, we could take a train to Casabianca train station and then walk a short distance to CIA Airport. Train tickets from Termini Station to Casabianca would only cost €1.50 each and we’re not adverse to a walk, especially since everything we travel with fits into a carry-on size backpack (think: no rolling luggage!). This alternative option peaked our interest so we pulled up Google Street View and followed the route we’d be walking. It wasn’t conclusive how entirely safe (or not) it would be to walk to CIA Airport from Casabianca train station, since the images on Street View were several years old. However, it only seemed like a short portion was without a proper sidewalk, and even then we’d be able to walk in the grass. Since we aren’t known to shy away from walking, we figured we couldn’t pass up saving 90% (€27) over a taxi, 70% (€7) over a bus, AND having an adventure! On the day of our departure from Rome, we walked to Termini Station and found an automatic ticket machine for the trains. We selected English, entered our destination station (Casabianca) and purchased two tickets for only €3.00 total. The tickets were valid for the entire day, and we made note of the train number for the next departure. On a side note, pick-pocketing is such an issue in Rome, that not only do they have the fairly standard signs warning tourists, but when you tap the screen of the ticket machines a visual message and an automated voice warns you to be careful of pick-pocketers. Ticket machines at Termini Station in Rome, Italy. Clockwise (from the top left): Ticket machine at Termini Station, touch screen with seven different language options, purchasing two tickets for just €3, payment options available include cash and credit card (even American Express), our train tickets! As the departure time of our train approached, the platform was announced on the digital signboards throughout the station and we headed to the appropriate platform. When we arrived, the train was there, so we boarded and had no problem finding empty seats. In fact, the entire car was empty, although a few people boarded as we waited for the 12:28 pm departure. To our surprise the departure time came and went, as did the other people who’d boarded the train. After waiting the few minutes we felt was appropriate for a late train to finally depart, we exited to investigate why we hadn’t left yet. We found our intended train no longer listed on the digital departures sign and began to worry! After speaking with customer service it turned out that we were in fact on the correct platform, just not the right train! Apparently, two trains were on the same platform and we needed to be on the one in front of the train we boarded! This was the first city were we’d encountered this, as all other places had only one train per platform, or divided the platforms with letters (for example, 19A and 19B) when servicing multiple trains. Termini Station train platforms, Rome, Italy. Platforms are located on the east side of Termini Station and can be found by following the bright yellow signs on the floor. Don’t forget to validate your ticket on the platform before boarding the train! Lucky for us, we had plenty of time to spare because the next train to Casabianca was an hour later. This time we headed to the front of the platform and made sure we were on the foremost train. We were immediately put at ease since the train was full of people and then reassured once we confirmed with another passenger that the train was indeed going to Casabianca. Twenty minutes later, we disembarked at a small station that consisted of a couple of benches and one small building that offered cover from the elements to waiting passengers. Casabianaca Train Station in Rome, Italy. Tip: It may seem like you should disembark at the Ciampino stop since it bears the name of the airport, however this is the stop to the city of Ciampino. The closest stop to the airport is Casabianca. The walk from Casabianca Train Station to Rome Ciampino Airport (CIA) is just 1.7 miles. This is where the journey became a bit of an adventure! We followed the walking directions on Google Maps and took the street through what seemed to be a rural part of town. It was one lane in either direction and for mid-day on a Friday there was heavy traffic. There wasn’t a formal sidewalk, so we walked on the dirt and grass on the side of the road. The most ‘hairy’ portion of the walk was the single roundabout, which we crossed carefully but quickly. The walk from Casabianca Train Station to Rome Ciampino Airport (CIA). Exit the station (top left photo), and head east. Very little of the area will have sidewalk, and the path varies in width. The roundabout (bottom right photo), is the most challenging area to cross when there's traffic. After the roundabout, a small road led us to a wide dirt path for pedestrians (Via Appia Antica). It was a very pleasant and quiet walk that from what we could tell, if we’d stayed on it, would’ve taken us into the city of Rome, Italy. 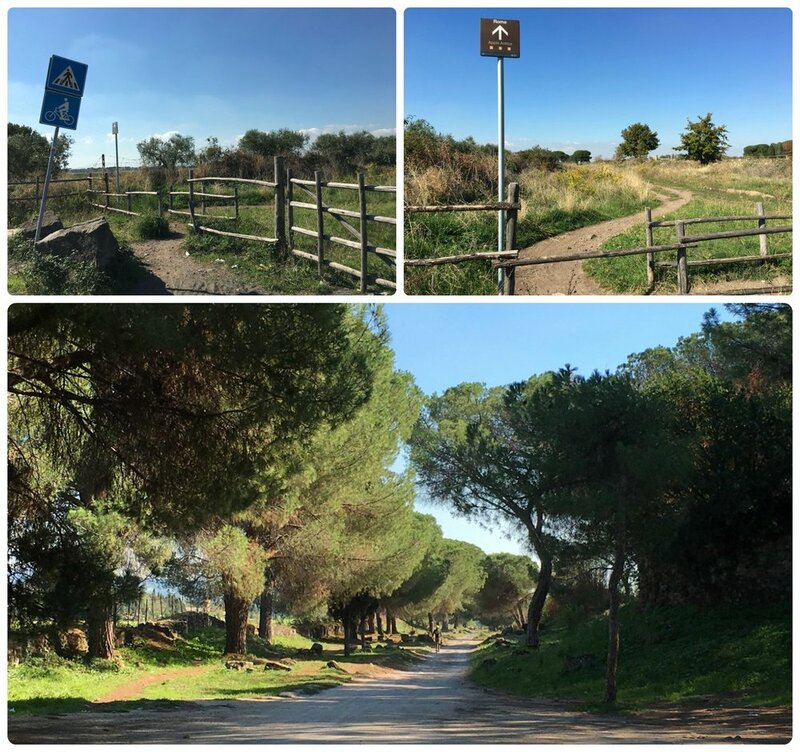 On the right side of the road, we spotted the walking path (top photos) marked with a brown Roma, Appia Antica sign (top right photo) and passed through the opening in the wooden fence. The path shortly widened and was linned with trees! After about 10 to 15 minutes we made a right turn on Via de Fioanello, which unfortunately didn’t have a sidewalk either, although at that point it was only a short distance to the airport (about five minutes). In total, the walk was about 35-40 minutes from Casabianca train station to CIA Airport terminal doors. To get to Rome Ciampino Airport (CIA) make a right on Via de Fioanello and you're almost there (about two blocks to go)! Tip: Ciampino Airport gets the job done, but doesn’t offer many amenities. There’s a duty free shopping area, but it’s much smaller than most European airports we've flown in or out of, and there’s limited food options. CIA Aiport also doesn’t have a lounge, so if you’re using Priority Pass and have the option of departing from FCO, we’d highly recommend it over CIA! At the end of Via de Fioanello you'll come to a roundabout. Continue straight ahead and you'll be at Rome Ciampino Airport (CIA). We chose the simpler, less adventurous route into Rome from FCO Airport, but since we had more time on the day of our departure, we were up for an adventure and a bit of a walk. We wouldn’t recommend it to those who don’t like walking on a road without a designated sidewalk or for those who want a direct option to the airport. However, we’re happy we chose the journey we did. Overall, it took about the same amount of time as a bus, was significantly cheaper, we got to walk in a less populated area of a suburb of Rome, and we’ll forever have a great story. Therefore, it’s a thumbs up from us!